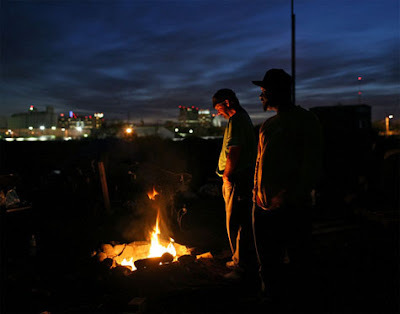 Homeless men warm themselves next a campfire at a homeless tent city in Sacramento, California. Nice fire...see 'that Emerald City' off in the distance, reminds me of the "Wizard of Oz." And, how many empty homes are 'on the market' these days? Yet, my government is getting ready to build some more. Might 'employ' a few for a couple of months. Ain't there a better way to deal with what we already have? Might mean sharing, good gosh, heaven forbid.